The classroom community becomes a launching pad for learning about our society and the world we are creating. Middle School students’ exploration of community continues in the 7/8s year. The social studies core curriculum focuses on the Hudson River. Students observe the river firsthand during field trips. They do research using books, photos, maps, and interviews with people who use and work on the river. They work together to build a model of the river from its source to its mouth, including natural and man-made features. After studying the river as it is today, students go back in time to study the Lenape people who lived along the Hudson 500 to 600 years ago. They apply what they know about the river to begin to understand the interdependence between people and their environment. Through historical fiction, field trips, Lenape tales, illustrations, photographs, and some research, students learn about the Lenape people’s daily life, society, and beliefs and ceremonies. 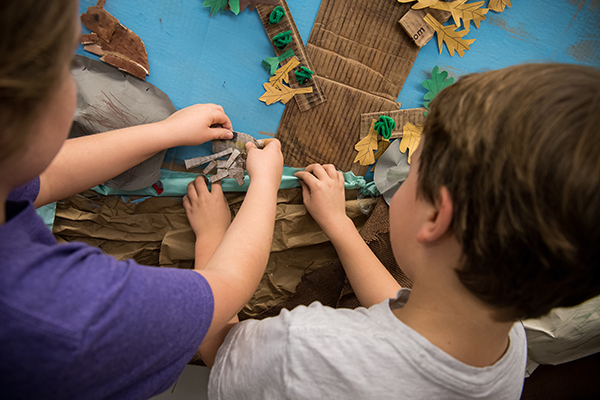 Students rebuild their Hudson River model to depict life along the river before the arrival of the Europeans. This exploration supports the 7/8s Racial Justice and Advocacy (RJA) curriculum, which focuses on the concept of human rights. Students use their newfound ability to consider multiple perspectives, combined with their emerging awareness of the “long-ago” world of the Lenapes of Manahatta prior to the arrival of Europeans, as they discuss the changes in our country’s political and racial structures, assumptions and stereotypes about modern-day Native American culture, and ways they can stand up for the rights of marginalized groups in our society. In reading, with help from teachers, 7/8s children continue to choose “just right” challenges for their growing comprehension skills. As the year continues, they improve in making these choices on their own. They build their reading stamina, and review and practice decoding skills and strategies for understanding longer words. Word work includes “trick words” they need to recognize by sight. 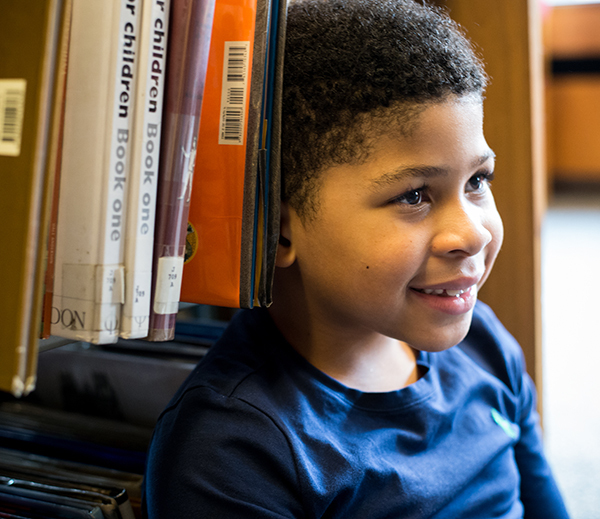 Throughout the year, students meet in book groups to develop comprehension using skills such as making connections, predicting what may happen, and asking questions. In writing, 7/8s increase their ability to use writing to express their ideas and to communicate with others. They explore genres such as the personal narrative and the fairy tale and learn that a story has a clear beginning, middle, and end. They explore literary devices including dialogue, metaphor, and simile. They write captions to describe their own paintings and discover that “juicy” language can create a picture in the reader’s mind. In the 7/8 year, children are held responsible for accurate spelling of a list of reference words, which grows throughout the year, and move toward greater proficiency in proofing and correcting their work, including punctuation and capitalization. Building on their Lower School Library experiences, 7/8s continue to become adept and independent library users. Midway through the year, they create Library Manuals that capture the strategies they have gained for making the most out of their library visits. Students also have an opportunity to hone their critical reading skills by voting on picture books for the Irma S. and James H. Black Book Award, which is presented by Bank Street’s Center for Children’s Literature. For this annual award, children in the 8/9s and 9/10s select four finalists after evaluating 16 current picture books, guided by the librarian and their classroom teachers. The 6/7s and the 7/8s read the four finalists and vote, along with students from hundreds of schools around the world, on the winning book. Spanish in the 7/8s is mainly concerned with exposing students to the language in meaningful ways. They learn Spanish vocabulary that is practical and useful and have plenty of opportunities for listening and speaking. The focus is on social language that students can use freely inside and out of the classroom, with a goal of building a vocabulary that allows students to be active participants in a class taught completely in Spanish. The 7/8s meet with the Spanish teacher once a week for 45 minutes in their classroom. Building number fluency and automaticity (for example, knowing pairs that make 10 and 20, and knowing doubles facts). 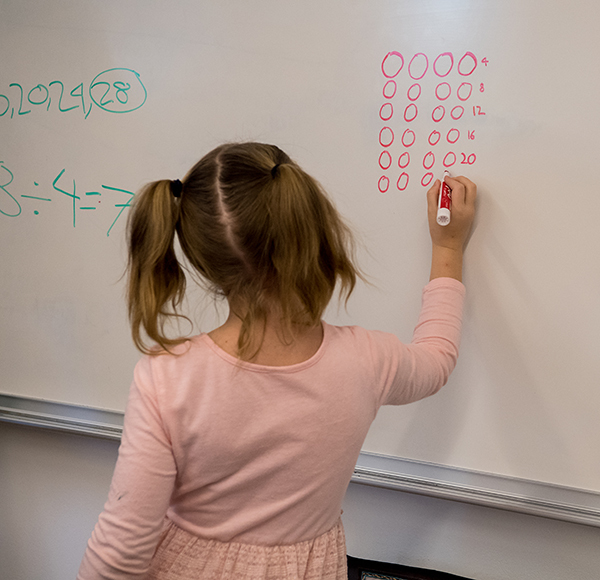 A review of addition and subtraction from 1 to 20, with a focus on engaging children in documenting and explaining their work. Linear measurement in inches, centimeters. Telling time using an analog clock. Place value and problem-solving to 1,000. Addition and subtraction to 100. Coins and fractions—specifically halves, thirds, and fourths. We reinforce the understanding and use of these concepts as they arise across the curriculum and in daily life. Science in the 7/8s year is interwoven into the core social studies curriculum. In the fall, 7/8s learn about the adaptations that allow different animals to thrive along the Hudson River. A terrain model is used to solidify children’s understanding of river systems. In the winter, 7/8s examine different fish of the Hudson River, and learn the internal and external parts of a fish, culminating in a dissection. Science in the spring relates to the Lenape and includes planting and observing the staple crops of the Lenape people known as the “Three Sisters” (corn, squash, and beans). The Middle School technology program is developing quickly. The 7/8s classrooms use a range of technology for instruction, documentation, and collaboration. Our arts curriculum continues to support students’ growing interest in the world around them. 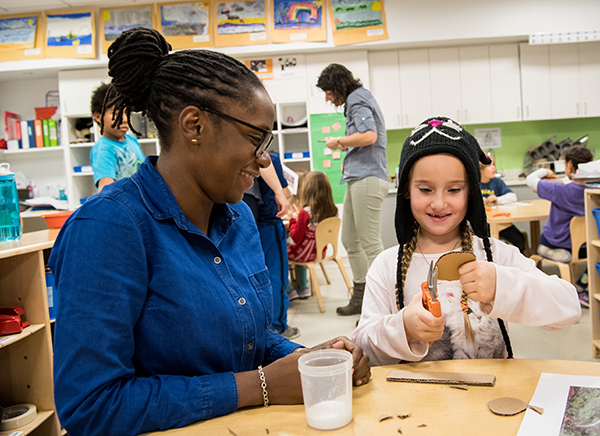 The integration of art into social studies, language arts, math, and science helps children make personal connections to their studies and continues to deepen their learning. Art in the 7/8s year focuses on developing a basic understanding of the representational, narrative, and expressive possibilities of two- and three-dimensional art materials. Students explore painting, clay, collage, three-dimensional construction, and printmaking. Most students in the 7/8s are solidly in the “simple images” stage of artistic development. They can combine shapes and colors to create simple representations of familiar subject matter, and they are beginning to consider how to represent a figure and environment together to tell a story. Projects include paintings and sculptures of animals, a printmaking project that explores materials and textures, and puppet-making. In shop, students start with a review of tools and techniques for shaping and attaching wood and create a sculpture that is an homage to trees. This project is followed by a car project. Throughout their work-process, students confront and problem-solve as issues arise. Students are encouraged to consider cause-and-effect and to learn from their own experiences as well as from their classmates. Drama in the 7/8s introduces theater games, pantomime, and improvisational activities. During the 7/8 year, the class is divided for consecutive-week cycles of either drama or movement in fall, and the groups switch in the spring. The centerpiece projects for both cycles are workshop adaptations of popular children’s books. The plays are rehearsed in the Auditorium, and the groups are encouraged to improvise freely. The cycles culminate in “shares” between the groups. 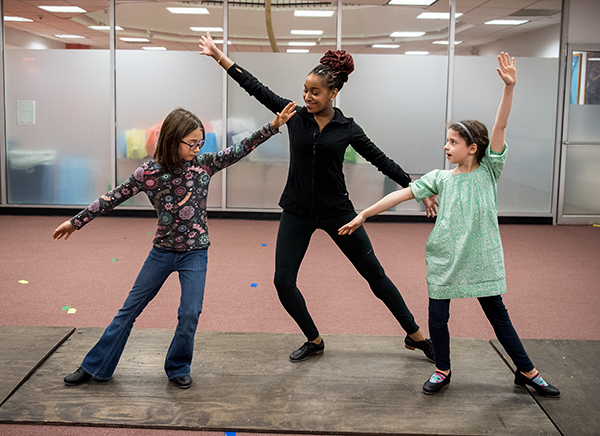 The drama program presents a play in the Auditorium for the movement group, and the movement group, in turn, shares a movement piece in the Children’s Dining Room. The music curriculum for the 7/8s contains interconnected elements and continues to expand on the skills and concepts acquired through the 6/7s. All students in the 7/8s participate in weekly chorus rehearsals and perform in winter and spring concerts. Singing continues to be the core of the music curriculum for the 7/8s. 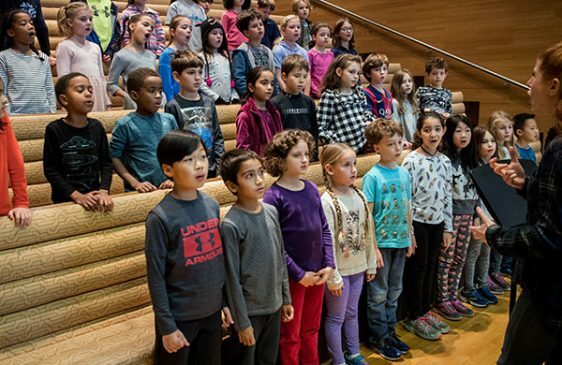 In relation to the year-long study of the Hudson River, students learn songs about the Hudson written by Pete Seeger, Bill Staines, and others. Music Literacy helps students expand their knowledge of note values and begin reading from the treble staff. They gain familiarity with the scale, strengthen their understanding of the connection between musical pitches and become more independent note readers. Instrument Playing includes barred instruments such as xylophones, metallophones, and glockenspiel, as well as percussive instruments. Students sing and accompany themselves using repeated patterns which allow opportunities for improvisation and collaboration. In the late spring, the 7/8s begin learning the recorder. 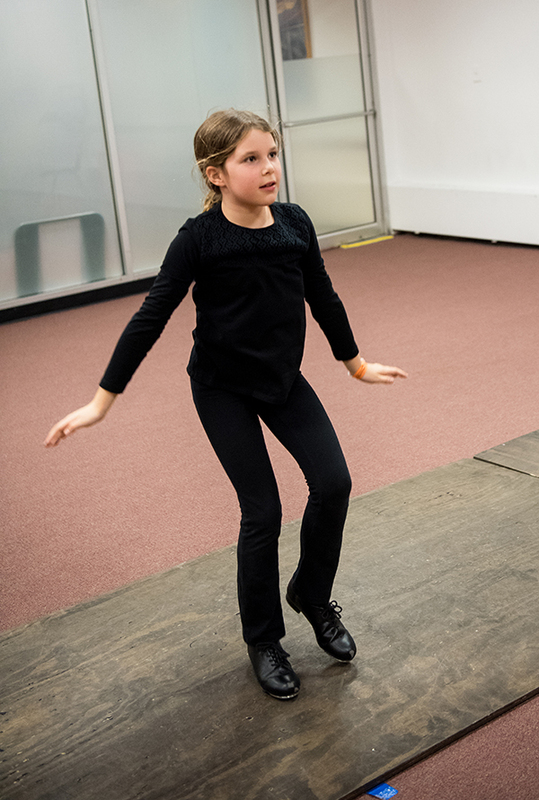 Movement/Folk Dance encourages students to make connections between patterns in music and physical movement. They also learn collaboration, self-regulation and, most important, listening. Music Appreciation helps students discover the expressive characteristics and nature of musical instruments in storytelling by studying Sergei Prokofiev’s Peter and the Wolf. Guided listening in preparation for a wide range of field trips helps students explore elements such as form, patterns, and expression in music, and to learn concert etiquette. Classes in the 7/8s help children build creativity, imagination, risk-taking, and confidence. Children explore concepts of space, time, and energy. They develop balance, coordination, and spatial awareness. Students in the 7/8s can incorporate choreographic principles of unison, canon, and call and response into their work. They collaborate in pairs and small groups to create group choreographies. The year culminates with an introduction of Motown music and movement. In small groups, students select songs and craft their own Motown-themed dances using principles covered throughout the year. Physical Education classes meet in the gym and on the rooftop play area. Activities focus on developing coordination using balls, bean bags, hula hoops, and scooters. Students build cardiovascular endurance and spatial awareness with games of tag. Team games develop problem-solving skills, teamwork, fair play, and sportsmanship. The 7/8s have strong feelings about fairness and winning and losing, so sportsmanship is a prime focus, and games during class do not keep track of points scored. Free time with equipment lets children work at individual levels, on their own and with partners, and to create their own tricks and games. The 7/8s children are developmentally able to consider multiple perspectives. We study traditional fairy tales and consider whose stories are being told and whose are not. With an emerging awareness of what “long ago,” students investigate how the Lenape lived before and after the arrival of the Europeans to Manhattan and explore the concept of human rights.